A new law in Buffalo, New York creates more work for landlords. There was little notice when the law went into effect this spring. Landlords must now draft an additional disclosure document- one that lays out whether smoking is allowed on the rental property, and if so, where. The tenant must receive this disclosure before they sign. Landlords also must modify rental leases to track the new policy. So why are landlords so happy to have this extra work? In part, because legislators took the time to survey landlords and tenants alike before crafting the new rules. An eviction judge participated in the drafting of the law. Litigation over second-hand smoking is rampant in Buffalo, most commonly in eviction cases. The courts consistently have shown leniency with tenants who wish to break their lease commitment because someone else in the building smokes. In fact, the cases have defined second-hand smoke as a hazard that destroys habitability – a legal term of art in constructive eviction cases. The lawmakers are hopeful that this new language will quell a number of landlord-tenant disputes. Landlords in turn are happy because it could keep them out of court. Tenants favor nonsmoking rentals. Less than 1 in 5 adults smoke. Tenants with a nonsmoking preference will pay higher rent. There is an immediate reduction of risk of fire on the property. Smoke-free properties are cheaper to maintain. The same anti-tobacco groups have offered to provide sample disclosure statements for landlords to use. The Erie-Niagara Tobacco-Free Coalition has offered to reimburse landlords up to $500 for the cost of advertising a smoke-free building if they use the international no smoking logo or the phrase “No Smoking Allowed” in apartment rental ads. This law comes on the heels of a number of important court cases, including several that have held that because second-hand smoke is known to cause illness and disease, including cancer, landlords can be held liable if a tenant gets sick due to second-hand smoke. Landlords can also be held liable for damage and injury due to smoke or fire. 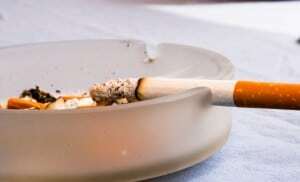 Additionally, the New York Supreme Court has held recently that smoking is not a right and therefore smokers cannot sue for discrimination if a landlord goes smokeless. That opinion, coupled with the new rules, makes it clear that it is not against the law for a landlord to ban smoking and to refuse to rent to applicants who do not agree to abide by the policy. However, the new rules make it clear that tenants must be notified of the smoking ban at lease-signing or before. Oregon has passed similar legislation. See our feature, Battle for Smoke-Free Apartments Heats Up.